Emencia at your side in the design of your site. The website design must focus on a friendly and intuitive navigation so that beginners or advanced users can quickly access the information sought and the various headings proposed in the summary. 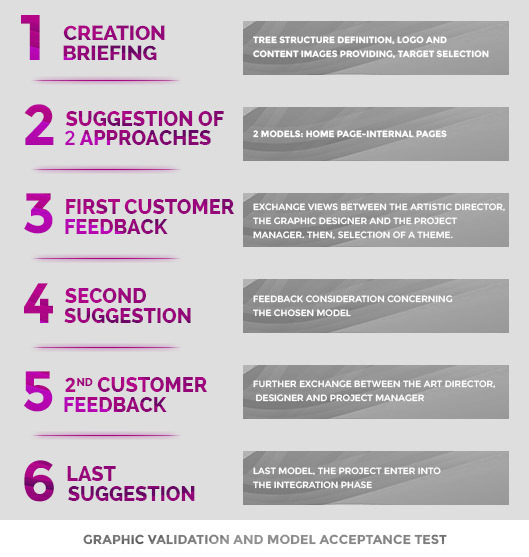 Design of a graphic charter with the greatest rigor. Creative research will focus on a balanced graphic design to give the user marks when browsing: choice of fonts, colors, shape buttons, chapter headings, location and treatment illustrations will be studied with the utmost rigor. The layouts will be designed to fully utilize the advantages of a dynamic site: Adding page will be automated. The model is optimized for viewing at 960 pixels for the following browsers: Internet Explorer version 9 and above, Mozilla Firefox 3 and above, Safari (3.2.x and higher for Windows and Mac operating systems), Chrome Version 3 and higher. Specific solutions to facilitate your specific marketing operations. Our frameworks are based on the MVC principle. The graphical charter is independent from the content, which enables to assign specific templates to the whole structure of your website or just to a part of it: thanks to this solution you are allowed to change skins on certain items for specific marketing campaigns in a fast and flexible way. Our clients can also entrust the execution of the graphical charter to their communications agency. Emencia then realizes the integration of the graphic provided and the development of expected features. The requirements gathering is important to define the spirit of the site in order to develop a consistent graphic line with the overall client communication. It helps to gain a better understanding of the project's constraints. This briefing is usually done during the launch project appointment.